There isn’t just one path to a STEM career — in fact, science and technology leaders in government and industry come from various educational and professional backgrounds but may share a curiosity for how things work. That’s the case for Defense Advanced Research Projects Agency Deputy Director Peter Highnam, Riverside Research President and CEO Steve Omick and Perspecta Senior Program Director Mark Westergren, anyhow — three STEM professionals driven by scientific and mathematical curiosity. 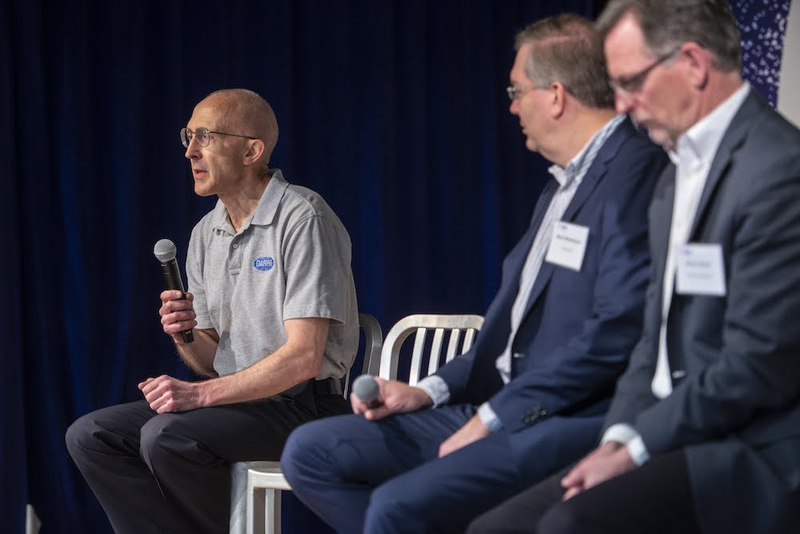 Highnam, Omick and Westergren shared their thoughts on the importance of STEM and their unique journeys into the field March 30 at the sixth annual K-12 STEM Symposium at the Nysmith School for the Gifted in Herndon, Virginia. Riverside Research was a presenting sponsor of the event, and Perspecta a platinum sponsor. Omick says he wasn’t particularly gifted in mathematics, but he was driven by the technical aspect of how things worked and was supported by encouraging people along the way. “My family was not one that had a lot of technical background educationally, but a family that understood the value of education,” Omick said. And for the technical understanding, Omick turned to external sources, like his teachers. But perhaps his first memory of this curiosity was when he was 8 and received an expensive toy robot as a Christmas gift. “I got curious about how it worked and I took it apart and my mother was horrified and furious at me,” Omick said, “but I was able to also then figure out how it worked and put it back together.” In fact, he enjoyed this part the most. When Omick entered the workforce, much of what he did was with the defense and intelligence communities, so Omick couldn’t talk to his family about his work. “But the technology I worked on, the things that I did, were nothing short of spectacular,” he said. Working with agencies like DARPA offer the kind of exposure that isn’t available anywhere else. “It’s just phenomenal to be part of that community,” Omick added. Now, he leads Riverside Research, a high-tech not-for-profit with the ability to fund internal technology research and development. Westergren was raised overseas, and his start in STEM was also driven by curiosity — specifically, how he got overseas, how airplanes worked and how all those systems worked together to get people to different places. Plus, in the late 1960s, he lived in the direct flight path of every plane coming into the airport and wanted to know how so many aircraft were able to take off and land. And in the 1970s, when space and the moonshot were all the rage, Westergren’s interest grew even more, trying to figure out how all these systems work together for travel. His parents were missionaries, without technical or scientific backgrounds, but they always supported his curiosity. So, Westergren decided to join the Reserve Officers’ Training Corps, and right after receiving his degree, he began working in the labs. “Right at the beginning, I was working with integrated circuitry, how to build integrated circuits . . . things that became the parts of computers and cellphones today,” Westergren said. He enjoyed what he was doing in the military because it was about driving missions, achieving outcomes and integrating different types of technologies to solve problems — whether defense or intelligence related. “Those integrated solutions are how we can solve our issues today,” he said. Westergren has since transitioned from the military to Perspecta, which combines a variety of STEM-related fields — like engineering, data processing and analysis, IT, cybersecurity and intelligence analysis — to help clients digitally move forward. Highnam works for what he believes to be the best agency in the government for R&D, but stressed that getting started in a STEM field is tough. “You will fail,” he said. But once those foundations are there, especially as a closeted mathematician and computer scientist like himself, “everything else just seems to happen,” he said. Highnam grew up farming with no technical background. “Nobody before me had gone to college,” he said, “and I remember being in school one day and discovering people could actually do their jobs wearing white coats.” And as unusual as that was to someone working on a farm, it was the spark that lit Highnam’s STEM interest. Science fiction was also big during this time, and to be in a little farming village and read about space travel, flight between planets and long-distance communication was inspiring. It opened Highnam’s eyes to what could be done with the mind, aside from just the body. He also had a math teacher who held a weekly math competition offering a Mars chocolate bar as the prize. Math, to Highnam, was powerful. “It doesn’t solve everything, but it really helps,” he added. And that was his beginning. Now, Highnam is doing a tour at DARPA, helping the agency continue with its mission of avoiding technological surprise. These early days of curiosity still play a role in what Omick, Westergren and Highnam do today and how they think about STEM. For Omick, as CEO of a company, he deals with something different everyday — whether it’s financial, technical or people-related. “I’ve developed that skillset of understanding how each of those different departments within Riverside work by being curious about how they work and getting involved,” he said. And that curiosity continues to help him ask questions and understand the answers. Westergren said it’s still important to recognize how the technologies coming together now will be the baseline and foundations for future innovations. “We don’t know how they’re going to integrate; we don’t know what those technologies will morph into or what kind of fields they’ll be connected to,” he said, but everything will have a STEM component and will integrate in some form. So, it’s crucial to constantly think about how things work, and how they work together — no matter the field of study. “STEM is going to affect everything we do in life. How you understand them will also make whatever field you go into, you’ll be better in that field,” Westergren said. And Highnam believes the country still has a way to go before it realizes the immaturity of the technologies today, but the potential is huge, and DARPA is relying on STEM students to bring the ideas of tomorrow.